There is an interesting and positive story in 'Building Magazine' by Sarah Richardson this week, outlining the fact that a hundred new schools are to be constructed through a PFI framework by the new Education Funding Agency.. 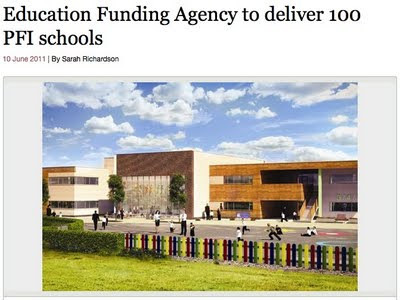 These should start coming to the market sometime next year with the first schools to be opened in 2014-15. This will be in addition to previously announced funding and focus on some of the BSF schemes cancelled after the last election . At the end of the article is a reference to more and more construction companies coming up with more standardised designs... I know that more will be announced in the near future. I frequently bang on about appropriate, high quality signage and graphics in schools. It is so important and, when good, can really enhance the entire learning environment. Visiting a school recently I was really disappointed to wait in a school Reception area and see some rather dull key word graphics scattered around. It was not a particularly welcoming experience and not enhanced by some very disappointing signage. Putting the rather predicable phrase 'High Expectations' directly above the toilets was not the best piece of design ever. As some colleagues with me mentioned, at least they did not put the word 'Achievement' there - they saved that to put above what appeared to be storage and premises offices further along the wall. I'm not sure that that is any better really. The Arts are being squeezed in schools, but they play such an important part of developing the whole learner. They are just as important as the more academic subjects. I just hope that these fab faces don't end up in someones box in the attic too soon! Roof Terrace at 'The Cube' civic offices, Corby. More and more schools are considering the use of roof terraces and raised external learning spaces, as a way of boosting usual space for things like social spaces, external dining facilities and increasing learning opportunities. Projects I am currently working on include several secondary schools wanting to create an upper floor sixth form external terrace, an external design technology terrace, a Year 7 recreation space as well as an small recreation terrace for SEN students. The thought of these often fills people with horror especially when they start shouting about health and safety. However, with careful design and a clear organisational model, schools and students are excited about these ideas coming to fruition. They don't have to be boring or plain spaces. With careful selection of materials, furniture and clever planting, they can be some of the best spaces around. It could easily be argued that not using roof spaces for students is a real wasted opportunity. How will they work on the schemes currently under development? - watch this space for more details when they have been built. Visiting a school recently I was really taken with their display cabinets in the foyer - totally transparent with really good clean lines and just looking so modern. It gave the impression of caring about presentation and helping create a really high standard welcoming reception. I would have liked to have seen some more with students work in as well, but further round the school, the display of student's work was excellent. It was not, thank goodness, the chunky, horrible, mock teak, great laminate things I see so often in schools that look old fashioned and chip really easily to reveal woodchip or MDF underneath. This small attention to detail and the image projected is exactly the kind of thing that people, especially students, notice. If we just put 'any old thing' in key public areas it sends out all sorts of messages about standards, attitudes and the importance given to detail. Some will mention that they are probably expensive - I'm quite sure they may be, but I also heard a significant number of people admiring them when they first saw them - it said something about the school straight away. And, as someone pointed out - reception display cases may be expensive, but how often do you buy them?